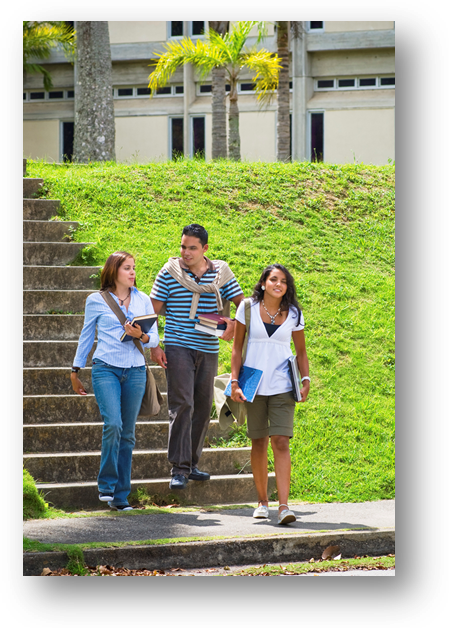 · Increase the perception of wrongfulness of underage alcohol consumption and binge drinking on and off college campuses within the community, among students, faculty, staff and other responsible community adults. · Increase perception of harm from underage alcohol consumption and binge drinking within the community, among students, faculty, staff and other responsible community adults. · 73.4 % of the students reported consuming alcohol in the past 30 days. · 66.4% of underage students (younger than 21) consumed alcohol in the previous 30 days. · 40.2% of students reported binge drinking in the two weeks prior to completing the survey. The body of literature regarding binge drinking by college students consistently reflects the value of the use of evidence based strategies through a coordinated campus community collaboration to address the conditions in the environment that support high risk alcohol use by college students. This environmental management model is “grounded” on the social/ecological model of public health which acknowledges and attempts to address a broad array of factors that influence individual health decisions and behaviors on the institutional, community, and public policy levels, in addition to those at the individual and group levels. 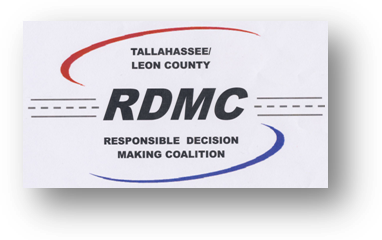 The existing community prevention coalition, the Tallahassee/Leon County Responsible Decision Making Coalition (RDMC) will convene a campus/community collaborative that will result in strengthened campus and community partnerships. The collaborative will address environmental factors that contribute to binge drinking and its resulting harms and then will develop a plan to implement evidence-based environmental management strategies to reduce binge drinking by 18-20 year old college students. The collaborative will use the SARG process to develop such a plan and engage in processes by which one creates cultural—or “environmental”—change on a college campus and in the surrounding community. 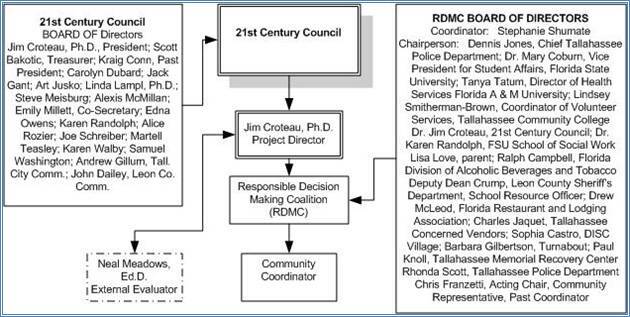 Through RDMC’s communication and marketing plan, the collaborative will increase knowledge and awareness of local college student consumption patterns and related consequences in the community, including students, faculty, staff and other responsible community adults. Students, faculty, staff and other responsible community adults will have an increased perception of the illegality and wrongfulness of underage alcohol consumption and binge drinking on and off campus in the surrounding community, as well as increased perception of the harm resulting from underage alcohol consumption and binge drinking. The collaborative will participate in training and technical assistance for evidence based practices provided by the approved state coordinating vendor. Such practices encompass a range of activities from awareness activities aimed at groups known to be at higher risk for engaging in problem behaviors, to environmental change that includes policy changes at the campus and community levels , to health protection programs that aim to minimize the harm incurred through problem behaviors and finally, to early intervention and treatment programs aimed at individual students. While environmental management encompasses a spectrum of programs and interventions from primary prevention to early intervention and treatment, it stresses the prevention of high-risk behavior through changes to the environment in which students make decisions about violence and their alcohol and other drug use. By mobilizing the Leon County Campus/Community Collaborative to change the environment in Leon County, by strengthening the partnership of campus and community initiatives and supporting effective environmental management practices as the tool to build a sustainable approach to substance abuse prevention on and off campuses, we anticipate a reduction in 30 day alcohol use and binge drinking by the 18-20 year old college population in Leon County. Project staff will coordinate with the state coordinating vendor and the IHE’s to administer the CORE survey to gather baseline data on the consumption/use of alcohol among 18-20 year olds at participating IHE’s in the first year of the grant and then administer a follow-up survey at the end of the grant period to identify a reduction in 30 day alcohol use among underage students and a reduction in 30 day binge drinking among underage students in the participating institutions. Project staff have met in the first statewide network meeting on Monday November 14, 2011. This meeting was an orientation to the purpose of the state program and the initiatives that were identified in the original Department of Children & Families grant application for funds from the US Department of Health. Plans are underway for coordinating the CORE survey to be administered at each institution participating in this project. Planned activities will be posted once finalized.